Harris Tweed is about quality and style, history and heritage. The fabric is handwoven in the outer Hebrides of Scotland, from 100 per cent pure virgin wool. Which means you’ll stay warm even when it’s as cold as the Outer Hebrides. The colour and subtle check of this M&S coat is playful enough to stand out from the crowd, while its tailored cut means it’s sharp enough to be worn over a suit. Harris Tweed British Fabric Pure Wool Coat, available at Marks & Spencer, priced £299. Not dissimilar to the classic G-1 bomber, this cropped jacket has all the charm of a vintage piece. The faux shearling collar and plush tan body ticks both the form and function boxes, keeping you warm while looking cool. Sling this on over a simple tee or sweat with slim jeans and sneakers. Tan Shearling Collar Jacket, available at River Island, priced £85. A design that’s remained largely unchanged since the late 1800s, the Montgomery duffle was formally reserved for sailors and a certain marmalade loving bear. It has since become a mainstay in the wardrobes of fashion leaders and followers alike. Double faced to create a true weatherproof barrier, this duffle will protect from the elements while the shape retains ease of movement. Be extra prepared for particularly blustery days by teaming with a chunky roll neck. Navy Blue Classic Duffle Coat, available at Original Montgomery, priced £169.99. Anyone that has braved a New York winter will tell you that we’re actually pretty lucky to have a mild (albeit miserable) cooler season. However, when those particularly brisk winter days do roll in, one should be prepared. This parka will keep you warm in the most brutal of climates, due to its coyote fur-lined hood and heavy-duty down insulation. Canada Goose Citadel Black Parka, available at Stuarts, priced £800. Since 2005, minimalist Scandinavian brand Our Legacy has been doing what the Swedes do best: subtle detailing, clean lines and a strong emphasis on quality. This particular piece is incredibly versatile, since it can be worn as two completely different jackets. Fleece-side-out says minimalist workwear, orange-side-out says contemporary sportswear. Keep your look simple with skinny jeans and plain leather trainers. Our Legacy Reversible Fleece And Quilted Shell Bomber Jacket, available at Mr Porter, priced £300. For such a timeless silhouette as the pea coat, it’s worth investing in quality. Saint Laurent offers exactly that in their classic black version, constructed from 100 per cent Italian wool with a cupro-cotton mix lining. Properly treated this will last for many seasons to come. However, to get long-lasting wear out of yours you’ll need to lay off the chocolate cake – Hedi Slimane’s signature trim fits don’t allow for much slacking in that department. Rock out Saint Laurent style with Chelsea boots and a patterned scarf. 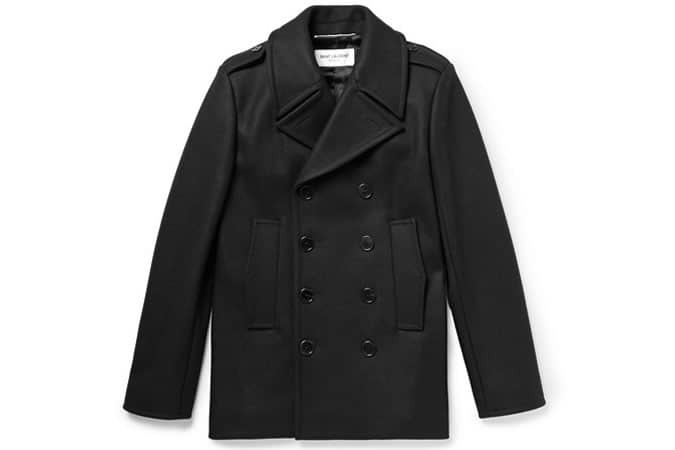 Saint Laurent Double-Breasted Wool Peacoat, available at Mr Porter, priced £1,180. Ami’s effortless Parisian chic married with Moncler’s aesthetically-conscious functionality is a match made in heaven. The classic padded down jacket is given a modern reboot with a spread collar, cropped body and wool felt patch pockets. C’est magnifique. Moncler x Ami Classic Padded Jacket, available at Farfetch, priced £745. Crafted in Italy from 100 per cent cashmere with a super-soft, brushed finish, this olive green double-breasted overcoat sums up Mr Paul Smith’s design philosophy: the wide, peak lapels and structured shoulders err on the classic side of men’s tailoring; the voluminous body and single button fastening keep it current. Try with chunky boots or thick-soled Derby shoes. Olive Green Cashmere Double-Breasted Overcoat, available at Paul Smith, priced £1,739. The double-breasted coat has shaken off its fusty overtones after streetwear guys warmed to its roomier silhouette. Though fashion lore would dictate that you never wear one open, if your layers are more Palace hoodie than Buckingham Palace three-piece, take advantage of the extra fabric and let it billow. Montague Check Coat, available at Burton, priced £60. 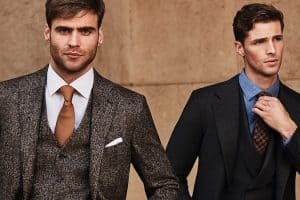 Masterfully cut from a cashmere-wool mix, this is about as good as it gets on the high street in terms of quality, cut and design. The narrow lapels and boxy silhouette of the coat embodies Cos’s particular brand of fuss-free Scandi cool. Offset the straight cut of the jacket with slim jeans or chinos. Wool Cashmere Coat, available at Cos, priced £175.